"A great recipe for stuffing a turkey. It is very moist! A pinch of marjoram can be added to this dish in addition to or in place of thyme. Try putting the stuffing under the skin of the breast. It makes the turkey very moist!" Melt butter in saucepan. Saute onion in melted butter until soft, but not brown. Add celery and stir well. Add 2 cups chicken broth. Bring to a boil. Cover and simmer for 10 minutes. Place bread cubes into large mixing bowl. Add eggs, salt, pepper, sage, thyme, and marjoram. Add onion-celery mixture; combine thoroughly. If still too dry, add more chicken broth. Makes enough to stuff a 10 to 15 pound turkey. See how to make a classic stuffing recipe for the Thanksgiving turkey. To bake dressing out of the turkey, place in a buttered baking dish, and bake at 350 degrees F (175 degrees C) for 45 minutes or until the top is lightly browned. More broth may be needed for this method to keep it from drying out. Exactly what I was looking for! Tastes just like what Grandma makes except that this is an actual recipe, whereas Grandma adds a "little of this and a pinch of that" :) I'll be making this again! 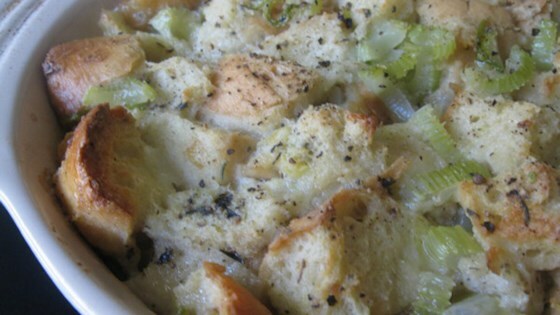 Great recipe for homemade stuffing! I cut this back to 8 servings and used 1 egg and eyeballed the herbs adding a bit of marjoram. This was a nice alternative to mashed potoates for a change! Very good. Moist and flavorful without being overpowering. Got many good comments from the family. The amount is generous and it expanded in the turkey quite a bit! Good basic recipe.I used Italian seasoning (3/4 teaspoon) it has all 3 ingredients. No measurement for the Marjoram.Turned out quite well, no leftovers.Thanks. Wow, I made great stuffing!! This was delicious and will be a regular family sidedish.